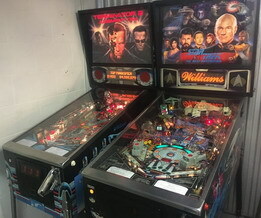 Pinball repair, pinball machines for sale, and pinball machine hire. Based inside the M25 my service areas are London and the outer counties - Birmingham to the South Coast. As a Pinball Specialist, I have been reconditioning pinball machines for over 35 years and have my own collection of over 50 and pinball machine parts. Contact Pinball Pleasure - the Pinball Specialist. Office (for post) - 305 High Road, Chadwell Heath, Romford, Essex, RM6 6AU, England.